Make searching for images faster, more helpful, and fun to explore. Modernize Bing's image search to Bing's new design aesthetic. 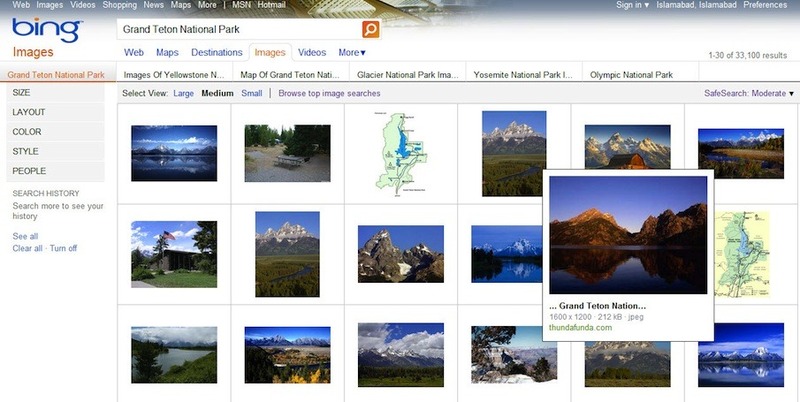 Image search is one of Bing's most popular features. It makes up 7% of its traffic of millions of users. However, by 2012, Bing's image search needed a re-design to help integrate into Bing's new, cleaner brand as well as make it faster and more convenient for users. Give users the ability to quickly scan the web's images, find the one that fits their needs, and, if they like, explore other related topics that may peak their interests. How could we make Bing be more fast, fluid, and glanceable to help users do more. Wireframes, mid-to-high-fidelity mockups, shipped final iteration to live site. Lead designer. Conceptualized how Bing's search features could yield more helpful insights for users in a simple, clear layout. Created new site interactions: filter images in an easy to find top nav bar, search tearms augmented by common keywords, exploratory side bar of related topics. Created new, denser grid for images to display in larger thumbnails with different aspect ratios. Tech Crunch - "Bing Rolls Out New Image Search With Better Search Suggestions, Filters And Bigger Thumbnails"
The Verge - "Bing image search redesigned with larger thumbnails and new tools"